A few years ago, Marlon Ray couldn’t imagine buying a home in southeast Washington D.C. after hearing about the crime and poverty associated with the section of the city. This changed on Feb. 21 when Ray moved into a house in Congress Heights that he discovered and purchased through a Ward 8 real estate company. Feb. 25 marked the second year anniversary of Anacostia River Realty, the real estate firm that has been working towards the goal of changing people’s negative perceptions of Anacostia and the other Ward 8 neighborhoods. Like many people, Ray based his initial perceptions of southeast on what the news reported and the conversations he heard about the high crime rate in the area. For the past three years up to his move into Congress Heights, Ray had been commuting an hour and a half from his Fredericksburg, Va. home to his job at Orr Elementary School on Minnesota Avenue SE. Although he worked in southeast, he had never thought about what the area had to offer until he met Darrin Davis. “Even though I was working in Ward 8 for the last few years, I had not considered residing here,” Ray said. Before Davis became what Ray referred to as a “real estate mogul,” Davis was a substitute teacher at Orr where Ray is currently an administrator. After getting to know Davis and his expertise in real estate, he began showing Ray properties, and Ray started to search for real estate in the area. The changes occurring are the opening of new businesses like the Uniontown Bar and Grill which Ray visited three nights in a row. The new and renovated homes built and marketed through Anacostia River Realty is bringing publicity along with change to the area east of the Anacostia River. On Jan. 9 an Anacostia home was featured in HDTV’s “My First Sale.” The reality show tells the story of a home’s first sale from the seller’s perspective. The Anacostia episode featured Davis as the seller’s realtor, and it was viewed during the real estate agency’s Feb. 25 anniversary party at the Big Chair Coffee and Grill. “The whole world got to see the Anacostia community,” Davis said. As a result of episode, Davis said people have been searching Anacostia and Davis’ name on Google as well as asking about events happening in the area. 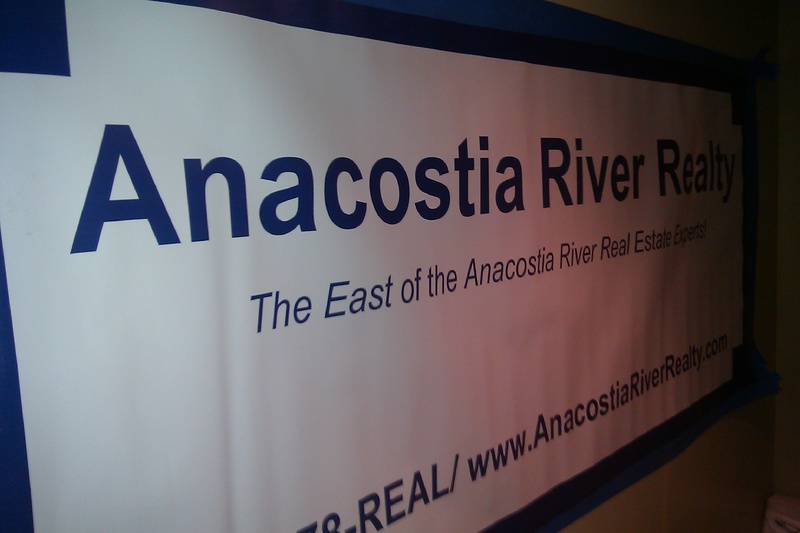 Anacostiariverrealty.com is the company’s main website. There is also an online store, a YouTube channel, homebuyer’s club and a Twitter account. Davis boasts his personal Facebook page of having 5,000 friends, his fan page with 600 “likes” and the company’s homebuyer’s page with 1,100 fans. Through these marketing tactics, Davis teaches his employees to look beyond merely selling homes. So far Davis is satisfied with his company’s progress. “Even though we’ve only been in business for two years, we’ve made a small dent in changing the perception,” Davis said. The individuals who celebrated the second year anniversary with ARR attended to show their support and appreciation for the company’s work. Anthony Anderson, an Anacostia native, grew up on Chicago Street, several blocks from where the viewing party was held. He spoke passionately about the negativity overtaking people’s perceptions. “You find that in most urban areas that the news will generally report on the negative of that area instead of the very positive things people are doing with outreach and mentoring groups and after school programs,” Anderson said. Anderson is a good friend of Davis and appreciates him marketing the positive aspects of the neighborhood and taking steps to help renovate east of the river. “I just love what he’s [Davis] doing as far as bringing the awareness and positivity back to Anacostia and making the dream of home ownership real to people who are trying to buy their first home,” Anderson said. Anderson is also displaying the positive attributes of the Anacostia people through his web soap opera “Anacostia: The Series,” which he says Davis supports. For the future of Anacostia, Davis foresees some changes in the neighborhood. He predicts that the property value will increase in 2013. After the Department of Homeland Security relocates to Ward 8, he explained that the area will attract those employees. Specifically, the man who bought the house featured in “My First Sale” works for DHS. “What he got now for $230,000, in 2-3 years, he would’ve been paying $330,000 or more,” Davis said. Marlon Ray recognizes the potential of southeast D.C. as he calls it “up and coming.” Purchasing a house there is his way of helping to improve the area, and he’s looking forward to getting involved in his new community. What is described as one of the “foundation events” during the 30 days, the Citywide Reentry Assembly, which is held at the CSOSA headquarters in Saint Luke Catholic Church on East Capitol Street SE, recognizes the accomplishments of the mentorship program and encourages people to continue their work. The other goal is to provide the general public the opportunity to join the reentry effort. Nathaniel Garvin is a Washington, D.C. native who returned home from prison 16 months ago. At this year’s assembly, he was named the mentee of the year for Cluster C, the faith-based mentorship program that operates in the northwest section of D.C.
With the help of the CSOSA/Faith Community Partnership, Garvin is currently working and taking classes online. He gives credit to the partnership for getting him an effective mentor. Garvin’s mentor, Anthony Hawkins stood beside his mentee during the assembly as the Cluster C mentor of the year. He has been mentoring Garvin for a year and has been overall pleased with his mentee’s progress and effort. Mr. Hawkins intends to work with Garvin until his objective of helping him reach independence has been achieved. “My goal is to not keep him under my wing but to let him soar on his own,” said Hawkins. As the reentry process was a difficult for Garvin, the mentorship process has been a challenge for Hawkins. Prior to the mentoring Garvin, Hawkins had worked with four to five other ex-offenders. Throughout his tenure, Hawkins said he has experienced different levels of success with the program. Nevertheless, he views the program as beneficial. “It’s not always an easy task, but it’s a rewarding task,” said Hawkins about mentoring. He also expressed the need for more mentors with the increasing number of “returning citizens,” but CSOSA’s mentor training program will help people become effective mentors. Unlike Garvin, ex-offender Gene Nelson has repeatedly reentered society. He attributes his recidivism to not receiving the type of help offered by the CSOSA partnership. Since his most recent reentry in July, Nelson has had a difficult time getting his life back to normal. Nelson took the initiative to attend the Feb. 10 reentry assembly to find out what CSOSA had to offer. He believes that the agency’s programs offer a “good opportunity” for ex-offenders, and that helping returning residents can solve the recidivism issue. “We need to teach them [law enforcement] how to help us. Locking everybody up is not the solution to the problem, because the problem is still going to be there,” Nelson said. Nelson also identifies the faith portion of the partnership as “the main thing.” He explained that in order to make it through the reentry process successfully, spiritual enlightenment and mentorship from spiritual individuals is necessary. “You have to walk out in faith. You have to believe in something bigger than you. You have to have someone who will show you the way to do it and how to do it,” said Nelson. Religious mentors like Hawkins use their faith as a means to lead by example. CSOSA provides several other services along with the faith-oriented programs. Yet, the overall goal of the organization remains the same. Associate director Hendricks said that the emergence of the partnership has allowed the expansion and development of CSOSA as well as raising public awareness of what the agency offers and needs to assist returning citizens. “Through collaboration and partnership, we are able to inform the public about reentry, the needs men and women coming home have and hopefully recruit more soldiers and resources to help people come home and stay home,” Hendricks said. On a warm Friday afternoon, individuals and groups of people are inside of Anacostia’s newly opened Uniontown Bar and Grill. It’s lunchtime and a man and woman sit at the bar and engage in conversation over burgers and fries while two women in business suits sit on a leather couch and do the same. After the first two weeks in business, Anacostia residents and workers appear to be fond of the new eatery in the neighborhood. Uniontown celebrated its grand opening on the corner of Dr. Martin Luther King Jr. Avenue and W Street on Feb. 3. Since the establishment is fairly new, some people haven’t had the chance to taste the food or experience the environment yet. This particular Friday afternoon was a first time visit for a few patrons. Jamie McKinney has been living in Anacostia for nearly 30 years. After passing the bar and grill several times without going inside, McKinney decided to stop in and order a signature burger and a Coke. One of his hopes which he couldn’t conclude after only the first visit was that Uniontown would attract a variety patrons when it comes to age. Young adults made up the majority of the lunchtime crowd at the time of McKinney’s meal. Periodically, a few older people walked through Uniontown’s open double doors. A younger man named Marcus was another Anacostia resident and first time patron. Marcus, who declined to provide his last name, was sitting at the bar alone watching the flat-screen TV posted behind the bar and eating chicken sliders and french fries. He couldn’t say much about Uniontown after only the first visit, but he appeared to be reasonably satisfied at the moment. The aspect of Uniontown that stood out the most to him was its uniqueness compared to the other eateries in the neighborhood. Tamika Joyner is sitting in the far rear corner of the restaurant closest to the kitchen. Her job, GreatSchools, is located down the street from Uniontown. Unlike Mr. McKinney and Marcus, the Feb. 18 afternoon was her third instance eating there. But on this trip, she invited a friend who was eating there for the first time. The menu is what brought Joyner back a third time to Uniontown. “The food is really good,” Joyner said. Compared to his previous jobs, Moon said the new indescribable feeling possibly comes from the patience of the patrons. Located in southeast D.C., he feels there is a great appreciation for a black owned and operated sit-down establishment in an area where it is rare to find such places. “I’m just happy to be a part of it,” Moon said. By the end of his meal, Marcus was nodding his head to the 1990s R&B music and Joyner was feeling comfortable while enjoying her buffalo wings. McKinney showed his appreciation for the service by shaking Moon’s hand on his way out, even though he preferred Pepsi over Coke. He was also satisfied with his well-done burger and fries that were beyond fast food quality, but after looking at his bill he saw that the quality came with a price. “If you don’t have money, $12 is high for a burger,” McKinney said. Right before entering the second floor east wing of the Smithsonian Institution’s National Museum of American History, a message in black marker is handwritten on a white board, and it reads, “Dr. King had a dream- What’s your dream?” This year’s Dr. Martin Luther King, Jr. celebration at the Smithsonian Institution’s National Museum of American History incorporated interactive events to enhance the learning experience throughout its weekend of activities. The weekend celebration started on Saturday, Jan 15. and continued through King’s birthday on Monday. Among the activities were the Greensboro Lunch Counter sit-in simulation, a Dr. King dramatic presentation, Civil Rights Movement singing and a roundtable discussion with Freedom Ride veterans. It was a time of fun and enjoyment but an educational experience as well. “This is a great opportunity for us to celebrate, but also an opportunity for us to learn,” says Brent D. Glass, director of the museum. The student sit-in simulation at the F.W. Woolworth lunch counter featured the four North Carolina A&T student-activists with audience participation. Dr. King’s words in dramatic presentation placed listeners back in the time period between 1955-1968 when the leader was at the height of his service. After a training session on how to dress, react and protect oneself she chose four volunteers to be sit-in protestors while the rest of the audience acted as the resistance. Dunge believes that involving the audience in this manner has a greater impact on how people learn history. “Having an actual person of the time makes a big difference by people putting themselves in the historical time period,” said Dunge. Dunge mentions clearing historical misconceptions as one of the significant impacts of the interactive presentations. She recalls such situations as one man thinking that only blacks participated in the sit-ins when both whites and blacks participated. In another instance, she encountered a young man who believed being nonviolent made a person a “push over” until he role played as one of the protestors. “You just have to experience it to really get the full effect of it,” Dunge says. Xavier Carnegie, another character interpreter, performed the words of Dr. King in dramatic presentation. He views interactivity as an opportunity to connect with the audience. From a spectator’s perspective, the interactive presentations had more of an enduring effect than traditional lectures and reading on such people as Alexandria, Va. resident Joanne Olson. “When you can involve people more, it leaves a lasting impression more than if you just sit and hear something or if you’re just reading,” says Olson referring to the activities. Along with observing the national holiday which honors King’s life and work, the Museum of American History stresses the importance of recognizing the lesser known Civil Rights activists. The student sit-ins program at the museum, where the original section of the counter is preserved, happens every weekend and conveniently accommodated the holiday schedule. Dunge, the program facilitator, explained that people know about the major pioneers like Dr. King and Rosa Park but don’t know the names of the many youth activists including the Greensboro Four who integrated the Woolworth lunch counter; Joseph McNeil, Franklin McCain, Ezell Blair, Jr. and David Richmond. The Freedom Riders discussion also highlighted a group of unknown, but significant and still-living activists. Miles Hirocawa, 15, attended the program and gained a greater understanding of the riders’ experience and purpose after listening to each of their stories. King’s birthday is a federal holiday in which most businesses and schools are closed. Many people use the third Monday in January as a day off, but the Olsons make an effort to commemorate Dr. King, and Joanne believes everyone should do the same. “When we have a national holiday, we need to observe what that stands for, so we try to find something that relates to his [King] life to do on that day,” said Olson.